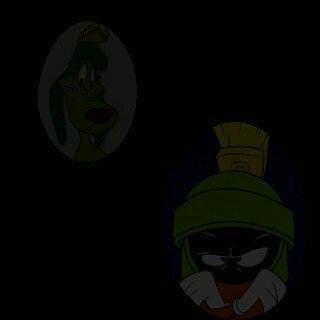 Welcome Earthlings to Virtual Marvin the Martian! This site is dedicated to that pint-sized go-getter and his faithful companion, Commander K-9. Here you'll find lots of information on the two including when they were born, their friends and enemies, mission, appearances and so much more! If it's all things Marvin and K-9 that you have been searching for then you have come to the right place. Stick around, and check out the who, why and wherefore's of this inimitable duo, and don't forget to sign the Interplanetary Log before leaving or you'll risk being blown into 17,670,002 micro-cells! 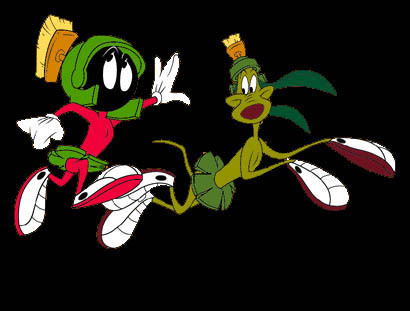 Click here to hear Marvin talk to K-9 about us Earthlings! I have been an avid Marvin fan for many years. 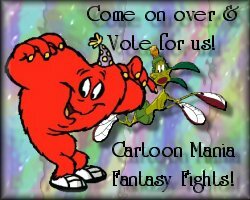 This little Martian gladiator and his always devoted canine commander have only appeared a total of 10 times on the screen but have managed to successfully build up a fan base that is second to none. Their fame and notoriety has spread to us here on Earth, and we are now reaping the benefits of not having been blown to bits yet by their Illudium Modulator! You are the Earthling to visit Marvin & K-9!